At CES this year, Lenovo announced a partnership with Google to produce a Project Tango phone. It’ll be less than 6.5 inches, cost less than $500, and be available later this year. Unfortunately, Mobile World Congress did not provide us an opportunity to learn more about this device. But we did get to see how the software is coming along by touring a museum with a Project Tango development tablet as our virtual guide. Among the features Project Tango’s machine vision makes possible is the ability to precisely locate itself indoors—no GPS, no bluetooth beacons—just by recognizing its environment. Unfortunately, we didn’t get a look at Lenovo’s upcoming device. We used these development tablets (more than a year old). The Museau National d’Art de Catalunya was the perfect place to get a feel for what this means. Armed with a Project Tango development tablet (Lenovo’s device isn’t quite ready for prime time yet), we set out on a quick tour of the exhibits. Tap on an exhibit you want to see, and the tablet draws a path for you to get there. You can use augmented reality to show a dotted blue line on the ground to follow. 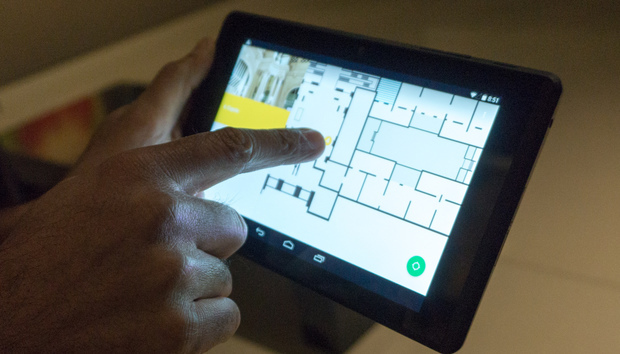 A Project Tango-equipped tablet guides us directly to the exhibit we want to see. Once you’ve found the art you’re looking for, the tablet can use augmented reality to help you learn more about it. As you pan the camera over, say, a painting, small markers pop up. Tap them to get more detail on your tablet about that particular part of the painting. Point the tablet at a piece of art and see augmented-reality touch targets to learn more info about it. It’s a neat demo, if rough around the edges. What is most exciting is not the actual museum tour software, but the idea about what this technology could mean in other locations. One could easily imagine a large store guiding you directly to the exact items you have coupons for. Or a theme park giving you a virtual line along the ground to follow to take you to that ride you want to go on. If your family or friends all had phones with this technology, you could locate them at the mall or ball game in full 3D space with perfect precision, instead of texting “where are you?” every five minutes. This is early stuff, and there are plenty of “gotchas.” For instance, many of the large public indoor areas where this technology would be useful would also be full of people who could block the view of the cameras that Project Tango relies on for location. Still, it’s good to see that this experimental technology is actually coming to market, and that third-party developers are working on real applications.